Hometown indie rockers Lab Coast played a straightforward, enjoyable set at Big Winter Classic's Patio "Albeerta" Stage yesterday evening (January 30), treating the audience to a set of introverted pop. 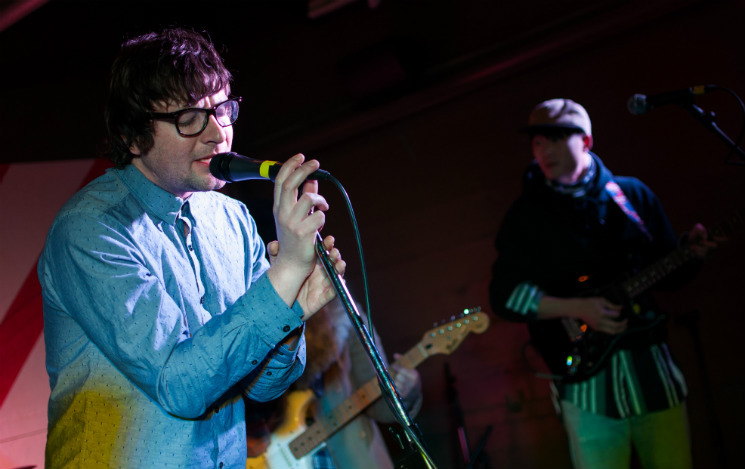 Vocalist David Laing — bearing a resemblance to Graham Coxon — and the band took to the stage quickly, launching into their steady lo-fi groove. Lab Coast excel at rhythm: their music interlocks and then comes apart in quick, unexpected changes. They're a truly cohesive group of players, seamlessly switching instruments and flowing from song to song. They played "As Usual" off of 2014's Walking On Ayr and "Remember The Moon," from their upcoming album of the same name. The sunny, distorted solos of "As Usual" proved a particular highlight, in line with the bright nature of Lab Coast's sound. Their set could have had more extremes in it to further engage the crowd, but the band's tight playing still captured, and held, the audience's attention.